I love, love, love my tiny Herb Garden. It’s a fun place to relax with a book, a cocktail, or both. And would you believe that a friend and I made this oasis over a weekend in 2007, and for a budget of about $100? All true. Tour the garden in the video above, and you’ll hear all the details concerning its simple design. Many thanks to Garden Design magazine for helping sponsor this episode of “Delicious Living.” To subscribe to the magazine and receive a bonus issue, click here. And to see more of my cooking, gardening, and housekeeping videos, please subscribe to my YouTube channel. Lovely. Purple petunias are my favorite. They have such a sweet fragrance that follows me around my yard. Would love to see a tour of your woodland garden. I made something the other day that was easy to make and because it had garlic in my opinion it had to be healthy. With all the herbs growing in your garden you could probably come up with a similar recipe that is delicious and healthy as well. I started with garlic bread and broke it into several pieces and put it on an oven tray. On the side I heated up ham and cheese. When the bread was ready, I added the ham and cheese to it and served it with a simple cucumber salad with sunflower and avocado oil. I also drizzled some of the oil lightly over the ham and cheese sandwiches. For a beverage we had luzianne tea. I’m diabetic so I’m trying to eat healthier. Great video Kevin. I love your garden! I could see myself sitting on the swing bench reading a great book! It’s a great video and a garden to envy! Thanks for sharing your garden with me. Love your garden! How do you maintain the pea gravel and how thick did you apply? I really enjoyed your garden tour and would like to see a tour of your house. Hi Debra Lee — You can apply pea gravel at any depth you like. I applied mine about 2 inches deep (thick). Nothing to maintain, really. The gravel is super-durable! Your design is great and your tips on growing always right on target! The winter photo of the boxwood edging was especially intriguing. So much disappears in winter and leaves one searching in vain for color or texture across the view of the yard. You have made a charming herb garden worth a look in all four seasons. I enjoyed your garden video and what you have accomplished. I have numerous chive blossoms and like the idea of making a chive infused vinegar. Look forward to your next video. Thank you Kevin. Any gardening moment that begins with a bottle of wine is prelude to a joyful time. Well done. Once again, Kevin, you share something beautiful, fun and a great learning experience. The tour was great! I have an herb garden but look forward to framing it this year with cuttings from my mature boxwoods. Great video, Kevin. I have a serious case of garden envy! Thank you for that video and the many ideas you have shared. I’m with you on the new super petunia….they are neat and fragrant. Thank you for all that you share, informing and inspiring and in such a friendly, gracious manner. So enjoyed…Thanks for sharing your herb garden with us!! Great design! Love the boxwood idea. I live in hot summy california…any ideas what I could use for that type of look? Thanks for all your ideas! How wonderful…all of it…house, gardens and you! Thank you! I would love to see a tour of your house and other parts of your outdoor areas, too. Yay! You win the prize for solving a problem we’ve had for a few years! We’ve wanted to make a private garden without blocking our view of a little meadow. Your brilliant idea of posts with galvanized wire mesh will keep out guests from walking into the one place we want for our personal enjoyment, and still maintain our view! Thank you! BTW, do you have a way to remove pea gravel that gets stuck in shoe soles so guests don’t accidentally walk on our wood floors with a rogue pea gravel wedged in their shoe and scratch the floors? Everything you share with us is marvelous. You are a blessing. Thank you Kevin. I enjoyed this video very much! Wonderful video, Kevin! You’ve given me a wonderful incentive to tackle our northwest corner! Fantastic garden. Do you have an additional vegetable garden for tomatoes and the like? Thanks for the garden video; more home and garden videos, please! While few of us can live in an 1825 home and build big, beautiful gardens, your fabulous blog and videos are a universal inspiration. Thanks to your advice, the garden beds around my nine-year-old home in an age-restricted community provide me year-round joy, views, and exercise. Love the recipes and cooking videos, too! Love your postings and have read them for years. I could always count on interesting and informative reading. What’s happen? Far too much each week seems to be old postings. Perhaps this aimed at new readers. Please don’t neglect your old, and sometimes elderly , fans. Inspiring! Thank you for your video of your lovely garden! We enjoyed your video and would like to see one for your woodland garden. We saw your place on a garden tour a few years ago and enjoyed all your effort on the gardens and maintenance. We have our own gardens and woodland garden and pond now. Your woodland garden was the inspiration for ours. Thanks, Kevin. Your blog and your videos are an oasis in a troubled, anxious and worrisome time. I love that you take us into a calm, beautiful and uplifting state of mind – and educate us at the same time! What a pleasure. Oh yes, a house tour, please. I always learn something clever and useful from you and seeing your herb garden video was super! So many ideas…I took notes. I appreciate how you took such a plain, almost forgotten looking spot at the back of your home and turned it into a showplace. On the cheap, too. Really inspiring, thank you. What a beautiful herb garden you have created! It’s such an inspiration for changes I want to make in my own. So rainy and cool here, my herbs have not done well this year. Except the peppermint. That would survive a nuclear blast fer sure! And it’s so useful – especially for Derby Day – I haven’t the heart to rip it out. Even so, I don’t think I could eradicate it if I tried. So I don’t. Great video! I like your resourcefulness and practicality. Your garden herb probably took months to build with lots of patience for that arbor to go on sale. Thanks for the educational video. Meanwhile, for a no-space apartment living, would appreciate some tips on container garden herbs for my kitchen window sill. I can grow a pot of mint but cannot grow rosemary. Spiders like rosemary too much. I’ve seen Photos of your container flowering plants inside your house at winter time. Got some ideas from those too. Thanks! Lovely garden. Want to copy it! Thanks for the inspiration and hard work. Loved this video, Kevin. So fun to watch about gardening. Your beds are beautiful and the whole area is great. Your herb garden is stunning, and you did a great job making your video! Did you lay landscape fabric or some other weed barrier under your pea gravel path? I mulch my paths and chuck the decomposed mulch into the surrounding beds, but that’s not as inexpensive a solution as a permanent pea gravel path. Really enjoyed the video tour of the herb garden. Great tips on design of the beds. I absolutely love boxwood hedges you have in your other garden. I want to propocate some rom a plant I have. What time ofear is best to take cuttings? Love your blog and video. As always, beautiful. But Kevin, where is the sage, rosemary, thyme and MINT? Mint for a glorious mojito! Those heads of lettuce and cabbage are terrific. Because of you, we will do pea gravel instead of wood mulch on the paths in the patio garden!!!!! Thank-you, Kevin-great budget ideas and a beautiful herb and vegetable garden. Your videos are always relaxing and inspirational The relaxing is important as I am caretaker for our very perky 94 year old Mom..
Beautiful! Thank you for the video tour of you herb garden. Loved the tour,Thanks ! Somebody mentioned your home was lucky to have you taking care of it . I completely agree. That’s why its smiles at you so much.! I also shop when things are cheap. I have set a raised bed on top of an ancient concrete turnaround . I find that it gets too hot in the summer. I have a mulberry tree that lends a bit of shade but apparently not enough. It gets western sun and that is hot in Atlanta. SUPERTUNIAS! Who knew? Gonna find some of those. Thank you for the great video. Appreciate so much your frugal vibe. XOXO. Wonderful video, Kevin, and wonderful garden! Thanks for sharing! Thanks! And thanks for mentioning how long you have been working on your property to achieve the look that you desired. It is nice to see goals that are reached with lots of effort and sometimes with not so much money. Much better than the flip type presentations. Enjoy your beautiful plants and gardens. Thanks for the helpful tips. Your garden is lovely! I built a 10 x 12 foot raised bed about 10 years ago. At the time we had a plentiful supply of horse manure compost that I blended in with garden soil and a huge block of sphagnum moss. Our soil was so rocky and hard that carrots never grew deep or well. The raised bed has produced tons of veggies and flowers over the years. I took your advice last year and laid down layers of newspaper and topped with wood chips. Even with the severe drought western NY experienced last summer my garden overflowed with green peppers, tomatoes, basil and garlic, not to mention mums, asters and snapdragons. Really enjoying your videos. Having seen pictures of your herb garden before, I never really paid attention to the fencing. That is exactly the kind of fencing I need so as not to block my view if the lake! I too want to know where your traditional herbs are growing…. Hi Judy Hines and Gail L. – I have basil growing against the fence, and parsley in one of the raised beds. As for mint, thyme, tarragon, and other perennial herbs that spread and spread, I keep them confined to pots! Kevin… you are so welcoming and make us feel like family! Your video was great…. Your garden and tips are wonderful! Darn I’ve tried boxwood cuttings to no avail….Boxwood is so beautiful…. and those larger bushes I transplanted (part shade) are not doing well…. getting yellow leaves… but new growth is surfacing. I’m praying they bounce back because they’ve been in the new space for over a year…. and are quite large. They were great the first season… the second not so much. Love the supertunias. My mint in pots does beautiful at beginning of season… then get’s yucky yellow… I’ve pulled up most from ground just because of the spreading and transferred to pots. MMMM…. not sure what’s wrong. Here’s a funny…. I have free tomato bushes (yes bushes… they are so robust) growing in my front garden… The birds must have dropped the seeds… and they are doing better than my other tomatoes in my raised beds….. (although they are coming along) Thank you birds…. now I see more tomato plants sprouting up here and there in my front garden evenand it’s mid June! Blessings! and of course we want to see more tours! Your herb garden has given me a new idea for raised beds surrounding a soon-to-be removed tree that is dangerously rotted (big limbs fall without warning). I will use the stump as the center focal point, with raised beds surrounding it cruciform style edged with boxwood. Might as well take advantage of the sun that will appear and use the stump to my advantage. My property is already fenced so no need for more. My garden is so lush I happily share it with my bunny, chipmunk family, squirrels, and myriad bees and butterflies. Thanks for sharing your ideas. You are always a ray of sunshine no matter what the weather. You’re herb garden is exactly what I’m hoping to do this year. I’ve had so much trouble with woodchucks and rabbits in the previous years it’s a must to put that wire fencing around my 4 raised beds. They never bothered my basil, but leveled my lettuce plants and pea pods. Tomatoes not so much, but the squash and egg plant were nibbled at. So much work to have this happen. Did they bother the herbs before you designed the fencing? Thank you for all you share, really enjoy it. How close did you put your boxwood starts to the other boxwoods you took them from? In other words I planted my normal sized plants about 24 inches apart and then put a start in between possible two in between is that too far or too close? Loved the video, and look forward to more garden and house explorations! I urge you to try growing rosemary variety “Arp” in your herb garden. It is winter-hardy in Zone 6, mine has been in the ground in a south-facing, masonry-surrounded location (Westerly, RI granite and some brick) for approx. 10 years now. Occasionally takes a hit of slight winter-kill but comes right back. Fully bloomed this year, at one point was over 40″ tall. Trunk at the base is the size of my wrist. Grown organically, soil amended with horse manure and wood shavings, and garden lime–once, about 7-8 years ago. Very drought-tolerant, a wonderful host for nesting mantises, too. What’s not to love about fresh rosemary, all year ’round? Kevin! I loved the herb garden tour! I will be retiring soon and will have time to fiddle more in the garden and an herb bed is on the planning board. Thanks for the marvelous ideas. And, BTW, I loved the picture of the beds covered in snow and outlined in boxwood. Lovely. Oh I would love to do this but have no idea where in the yard it should go!! So beautiful and resourceful!!! Can you instruct me how you used the boxwood clippings to plant small boxwoods around each bed? I would love to try this with my existing boxwoods. Just Love this garden,it’s simplicity and splendor are inspiring… thank you for sharing ! Your home is enchanting ..please keep on posting!!! Thanks for mentioning the bit about carrot and turnip greens being edible and how you like to prepare them. I loved the video and hope you’ll consider doing one about your main kitchen garden! Absolutely enjoyed the video for your herb garden. Yes! Would love a tour of your home. Thanks for the tour ! I’ve used your tip of starting boxwood from cuttings , great money saver ! Love boxwood! Great tour… always enjoy your decorative flair combined with practical innovative techniques. Keep ’em coming…. Ooops! I left my question in the wrong section…about house renovating. The name of the potted plant, resembling petunias, that does not require deadheading, please! Thank you! I’ve taken another enjoyable stroll through your lovely home and gardens this morning. What a joy! Hi Morningstar – Flowering plant in the urn is a Supertunia. The variety is ‘Bordeaux.’ Beautiful and fragrant! Wow Kevin! You have given some great ideas to beauify my two square foot gardens. Can’t wait to start that project. We were a little late starting our garden this year due to a relatives illness but we are back on track now. Thank you, always appreciate your many efforts! Loved your video! It would be wonderful to see a video tour of your house. I’d also be interested in seeing a video of what your gardens look like in the various seasons. Loved your garden tour and helpful gardening tips, Kevin. 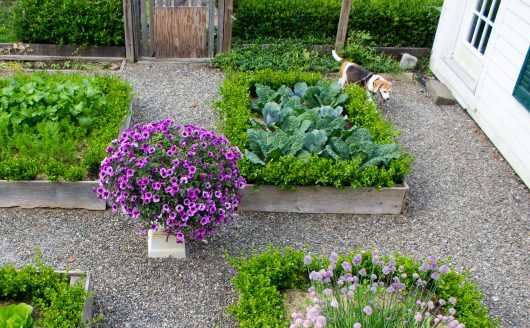 I think it is neat how you thought of giving your garden a shape to make it visually pleasing. I have always done that with flower gardens, but had never given it a thought to try that with veggies. You are such an inspiration. = ) Yes, I would love to see more tours of your garden and home, and of course always love the cooking videos. You will no doubt be nominated by the Academy this year for Best Video Oscar – Screenplay, Director, and Actor…excellent first foray into the world of motion pictures! Tell us about the carrot top pesto! I hate waste so mu goats and horses usually get them, but I’d love to make use of then too. Kevin, Thank you for your quick reply regarding Supertunia. I will now go on a grand search for them in our area (Jersey Shore) and in the catalogs. I really enjoyed this video. So informative ….love that you throw into this short little video so many tips – how to organically cover the grass, the ideal soil mixture, a low cost pretty gravel, how to keep critters away, when to get a good bargain on garden items, the easy care petunia, propagate boxwoods, how you use the turnip and carrot greens and more – fantastic info and charmingly presented – thank you! I so enjoy your garden and gardening tips. Loved the tour. You always make things beautiful. Love your humor. Once again,so enjoyable watching your talents unfold. Thumbs up!! I love reading your posts and viewing your videos. I am hoping you will offer a tour this year as I couldn’t make it last year. I live 10 minutes away and would love to visit to meet you and view your gardens first hand. Thanks for all your helpful hints/tips and gardening tricks. Great video! I’d like to see more detailed step-by-step instruction in future design videos. This one gave me some great ideas. Thanks! I loved your herb gardening video! I am so impressed with your projects and how you pull them together on such a low budget-so very creative, and you have such a down to earth personality. Keep up the awesome work! Thanks for presenting some great information. I think I might “borrow” a few ideas. I would love to see a tour of your beautiful home. Thanks Kevin for the great video to share your herb garden. It looks great and I enjoyed leaning some new things as well. Enjoy the fruits of your labor! I just read Garden Design’s email and had to pop over to say Hi and see your herb garden. It is lovely and gives me lots of ideas for starting my own. All of my herbs currently reside in pots and I would love to have them in a more permanent home. Hi Linda – thanks for visiting! Wow, your video was inspiring! I learned about the super (?) or supreme petunias. I’m going to look for those at garden shoppe. I look forward to your other videos. What a terrific garden. This is the best garden + house + food site. Love your house and all your decorative treatments. Your food receipts are so great especially the Cream Scones. The site presentation hits all the right notes. Love the piano playing too. Beautiful gardens, great ideas — love your garden tours and look forward to more! Loved your herb garden tour….and the boxwood perimeters……what a great idea…..and they really brings the beds alive during the drury winter….! 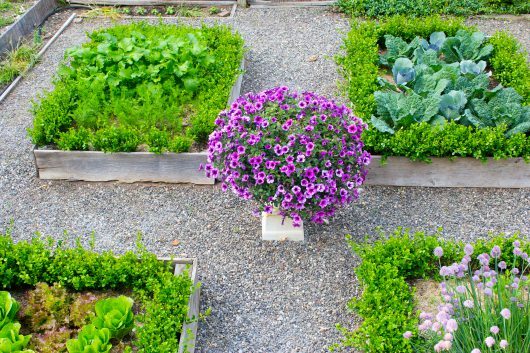 Great ideas for designing a garden on a budget! I loved the idea of positioning an urn in the middle.